Hybrid | Comics I Don't Understand - This site is now being updated daily at http://www.comicsidontunderstand.com. Please change your bookmark if necessary, and notify any web site with a link to the old address. I think one of those extra “back legs” belongs to the guy listening to the guy talking. More to the point, gallons of what? Or does the G stand for something else with dog/cars? I was thinking M.P.G. stood for “Miles per guzzle”. That makes a lot more sense. I’ve seen dogs run very fast, very far, then stop for a large guzzle (or gulp, I guess) of water. Then they’re good to go again! 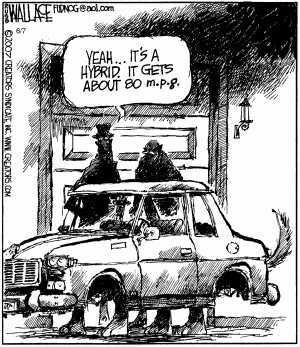 I think the cartoonist’s free association started with “mixed breed” and ended with “hybrid”. Then he forgot we’re not inside his head and put “hybrid” in the cartoon. Ah, that’s it: hybrid, half-dog, half-car.